1) This is a library book! Yay! I’m finally reviewing a library book! 3) The author, Kiera Cass, is hilarious. If you’re a writer, go watch her YouTube videos. You won’t regret it. Wow. That was totally not what I expected. In good ways and not-so-good (which is the polite way of saying “boring”). I’ve heard mixed things about The Selection . What did I think? It was surprisingly brilliant. Before I say anything else, though, the cover is gorgeous! I love the colours and I love the girl’s pose on the front cover. It really reflects the book! The dress is fabulous. It looks kind of like a peacock being blow-dried, but I love it. Characters? Introducing, America Singer! The fabulous red-haired spunky narrator whose only fault is her name. Seriously, people, a character called “America”? At first, I thought, “Well, it’s dystopian, so they probably don’t have an ‘America’ as we know it today.” WRONG. They did have an America (the country). And they talked about it. It got jolly confusing. Plus her nickname was “Mer”, which sounds like a fin-less mermaid. Me no likee. Apart from all that America was an awesome narrator. She wasn’t soppy. She had more on her agenda then smooching a boy. She cared about her family! (Even though her mother was pretty overbearing and bribed her into entering the Selection.) America was sweet and worked hard, yet had fiery temper and jumped to conclusions. She actually had a personality. Now, um, how do I put this? There is a love-triangle. But, wait! Don’t freak out! It’s one of the better love-triangles I’ve read. In first place, with no qualifications apart from passionate-kisser, we have Aspen. Aspen is a dead-end. Sorry. It’s true. 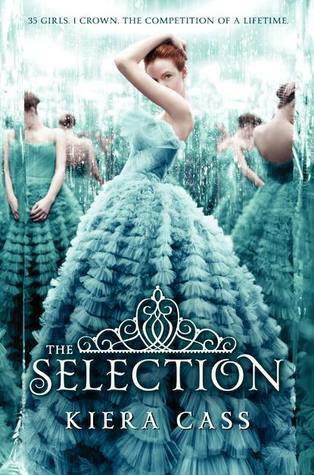 The Selection has a caste system. You get rated from One (awesome) to Eight (extreme loser). Aspen is a Six, so border-line-loser. Other half of the triangle? Bring in Prince Maxon. Qualifications include, calling girls “my dear” (gosh that annoyed me), working hard, and being 100% endearing until he has a hissy-fit. I feel like he was written to be Prince Charming. Which is good! He’s well written! But, through all his endearing jokes and actions…it all comes undone for me when he doesn’t really value what America says. He thinks he knows better (because he’s a prince?). Maybe that’s not how the author intended it! You have to read it to find out for yourself. Writing? I liked it! No fluffing around. America narrates in 1st person, and it was clear and easy to read. Plot? In all truth, it was slow. I liked it and didn’t get bored, but I easily put it down. The plot spends a lot of time doing photoshoots and wearing dresses. The only action-y parts were when the palace was attacked. And that included everyone huddling in their rooms. Not very exciting. I liked the web of intrigue and who-really-loves me, but it wasn’t enough. It reads like a reality TV show, or a dystopian version of Miss Congeniality. But it is about a bunch of girl competing for ONE guy. Bring on catty attacks and feline snark. All, in all, I definitely enjoyed reading this book! Awesome narrators always win big favours for me…and the fact that I was interested in the love-triangle and not cringing is a bonus. Book 2? Bring it on. Cait is happy because she borrowed 8 books from the library. library. She is busy stroking and reading them alternately. Apart from bemoaning the tininess of her book pile, she’s been loafing around the house with Mime. It’s holidays. They watch movies. They eat. It’s life. I liked this series too and I agree it is not the normal love triangle. I really want her to be with Maxon – I've read the second book too. I think this would be a fun movie! *whispers secretly* I'm for Maxon too. I feel like he's a lot more mature than Aspen. If Aspen's prone to throw those kind of tantrums now, then what's he going to be like later in life? And definitely! I think it'd be hilarious as a movie! In all honest true honesty (that was intense), I think it's completely illogical to call her America! It's so confusing, since it's set IN America. And yes! That's why I wanted to read it too. I don't really understand why it gets 1 star, but I've seen those kind of reviews! *shrugs* Each to their own, right? I felt similarly about this book (especially her first and last name -_-) but I think I was a little bit less impressed by it. It only got 3 stars from me and I felt it was just ok. I can't exactly pin point what about it was bad or why I didn't like it more. That didn't stop me from reading the second book though (that was a mistake). Except, I did like America better in the second book. I have heard a lot of people say that they felt Maxon didn't listen to or value America's ideas or opinions, but I don't remember reading it like that at all! I don't know if I just didn't read into all that as much or if I'm just not remembering that because I read it a while ago. Great review as usual! I can understand the 3 stars! It got a 4 from me, because it made me laugh (and I'm a sucker for anything funny). And I've heard woeful things about the second book. >_< I'll probably still read it, but not for a while. Maybe it's second-book-blues? It's really hard to write second books, I guess, because I find they're usually reeeeally awesome or not very good at all. Well, that is totally true! I've never thought about it that way. I think unbalanced love-triangles are interesting…but I just don't like badly written triangles. It drives me bonkers! Especially when the author really fleshes out ONE dude and not the other. It's not fair on the triangle! I liked Maxon more than Aspen xD But that's probably just because of the prince thing, what girl doesn't want to be a princess? 😉 The books are entertaining enough, I agree. Just not 1000% amazing. Great review! Kiera Cass is SO funny!! I don't think she vlogs anymore, but I watched all her old ones…oh gosh, I laughed so hard! XD She's awesome. America Singer…..HAHA I don't know, but the 1 star reviews made me iffy, but since you thought this was good then I shall give it a try soon! I have a lot more patience with love triangles than you do, Cait, and I still hated this one. Of course, I hated Aspen and liked Maxon for basically the whole book. Glad to hear you loved it, I heard the romance and main character is whiny but I would love the girly parts of it hehe. Thanks for the great review! I would have called the love interests whiny before the main character. 😉 But that might be just me. I did enjoy the girly bits too! Glitzy but just not wow-exciting. EEK! Thank you SO. MUCH. Cait! You're awesome. And this books sounds great. Thank you so much for the review, I'll definitely have to read it now. I'm probably going to with neither…I really think America could rule the world quite fine on her own. Yeah! Glad to see you enjoyed it Cait! I've been a little hesitant to read this because of all the hype it's received, but I definitely trust your opinion! I'm so glad the characters are well developed and that America is an actually good protagonist. Even though the plot sounds a tad slow and there's a love triangle, I have a feeling that they might be forgivable. (Especially considering how even you got interested in the love triangle! That's really saying a lot!) Thanks for another brilliant review Cait! I'll definitely have to get to reading this one ASAP! Aw, you trust my opinion? I'm simultaneously nervous and flattered. XD I felt all the failings were forgivable. I just felt…aw, gosh, that it was a bit uniquer (is that a word? It doesn't sound like a word) then most dystopians. "Surprisingly brilliant" … I may have to bump this book up on my want-to-read list. Great review! So, it's The Bachelor with a horribly named leading lady? Like I said on your STS post, if I don't have to pay for it, I might pick it up, but I just don't think this is my kind of read. Glad you enjoyed it for the most part, though!